Eager for a home-style Christmas while she considers a career shift, Kristen Benz leaps on the temporary job at Mistletoe Chalet. Soon she’s wrapping presents, trimming the tree, and helping her new boss’s tween daughter plan a Christmas Eve vow renewal for her parents. The holiday is imbued with a magical glow—especially when Kristen’s high school sweetheart appears on the doorstep. After years of medical school, Finn Garrett has promised his parents he’ll be home for the holidays. His detour to see his first love is supposed to provide closure, not rekindle their long-ago romance. 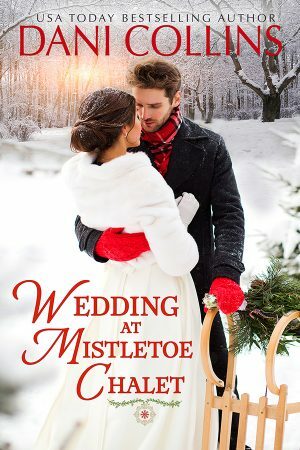 Can a matchmaking tween and the magic of Mistletoe Chalet spark the happily ever after that eluded them in the past? Kristen Benz arrived at Mistletoe Chalet and knew she was in danger of falling in love. She shouldered her small bag as she closed the door on her sturdy hatchback, ears stinging and nose pinching at the brisk air that accosted her. But the cold didn’t matter. Everything was so pretty! Nestled against a mountainside, guarded by craggy, muscled peaks of granite, the chalet was everything she wanted a mountain lodge to be. It sprawled in gabled wings from an A-frame front, its roof jutting in sharp angles toward the sky, like the mountaintops surrounding it. River-rock walls gave it a sense of reliable permanence while accents of natural wood formed crossbeams and railed balconies. Massive picture windows reflected the silvery-mauve light of growing dusk while inset lighting warmed the entrance to a welcoming, golden glow. A layer of snow sat as a thick, rich icing atop this wintry confection while colored Christmas lights reflected through the icicles dripping off its eaves. In the final touch of magic, snowflakes fell like specks of glitter. Even though she’d only seen the place online, and only from the outside, she had the oddest sense of homecoming. She drank in a bracing breath of evergreen and frost and thought, This is it. This is what I’ve been looking for. There were two sets of steps, but one had a sign that read, ‘Welcome to Mistletoe Chalet.’ She climbed that direction and knocked, then obeyed the sign on the door that said, Please come in. Kristen hesitated with the door cracked. A black nose poked out near her knee, trying to muscle the door fully open. “Okay, I got him.” A girl of about twelve or thirteen drew the door open and backed up to let her in. She had ginger hair and glasses. Her wide smile of greeting revealed braces and dimples. She held the collar of a big, shaggy dog with hair falling over his eyes and paws like mops. “And there’d be no snow left for the skiers?” Kristen guessed, closing the door behind her. She leaned over to let the dog smell her hand. He didn’t. He stayed and sniffed the laptop bag that Kristen let slide off her shoulder. She could hardly keep her bearings, there was so much to take in. The great room was topped by natural wood in its vaulted ceiling. Raw, polished wooden uprights held up the rail of the stairs and loft. The fireplace was more of the magnificent river rock from outside and the floor was slate. The feeling was rustic and welcoming, yet sophisticated. Modern pioneer. A home that was both luxurious and homey. Kristen couldn’t resist a peek through the open door next to them, into an empty office with a reception counter and a pair of comfortable-looking chairs in front of an unmanned desk. “It’s your birthday?” Kristen shrugged out of her jacket and hung it. “Last day of school before Christmas break. My class came skiing, but just for the morning. Then we played games.” She pointed to the stack of board games on the coffee table. Kristen unlaced her boots and curled her socked toes against the tiles, anticipating it to be freezing, but discovered the floor had lovely, radiant heat. Bonzo sniffed her toes, then gave her such an expectant look of, Let’s be best friends forever, she had to give him some love. When he padded away toward the fireplace, she straightened and took a longer look at her surroundings. “Ah. I won’t keep you then.” Kristen gave a nod-wink. Sarah chuckled and trotted up the stairs. Kristen moved to the stone fireplace where Bonzo took up most of the mat in front of it. A burning candle on the mantel gave off a scent of cinnamon: spicy and sweet. Bonzo sniffed her feet again, but otherwise didn’t move. She didn’t really need to warm up. The huge lounge was surprisingly comfortable, given the sub-zero temperatures outside and the high ceilings and abundance of windows. A dark blue sectional sofa faced the fireplace. It was overstuffed and comfy-looking, long enough to seat a crowd. Colorful throws and pillows in splashes of rust and buttercup made it seem extra cozy and inviting. Beneath the overhang of the loft, a table for twenty or so filled the dining area. Peering further, she saw a pair of French doors that led into what might have been a sunroom. The curtains were closed in there so it was hard to tell. She glanced back at the main dining area, noting that only a few condiments stood on the blue-and-white runner. There weren’t any centerpieces or other adornments. The view offered all the beauty a diner needed. Kristen wanted to park herself at that table, sipping coffee as she gazed across the endless view of the valley. Leaning, she saw a door on the other end of the dining area, one she presumed led to the kitchen. A chalkboard hung beside it listing what had likely been this morning’s breakfast: porridge, pancakes, bacon and eggs. Dragging her gaze back to the lounge area, she noticed the photos that hung on the walls, all stunning wildlife against the dramatic mountain scenery. “That’s me.” She lifted a hand in a wave. “I’m Wendy.” She came down the stairs and held out her hand. They were about the same average height and weight, but where Kristen had wavy brown hair and brown eyes, Wendy had a more Nordic look. “You made good time. Welcome,” Wendy said. “Oh?” Kristen thought she caught a brief glimmer of concern in Wendy’s expression, but Wendy was already waving to reassure her. “She was just a couple of weeks early. They went home the next day and Mom and baby are doing great. But Daddy is off until January, which means I lost Ted to the tours sooner than I expected and things have snowballed—ha-ha—from there. I honestly didn’t think we’d find anyone when he suggested I see if I could hire someone to get us through Christmas. I’m running so far behind, I think I’m out in front!” She widened her eyes in overwhelm. “Let me show you to your room first.” Wendy led Kristen into a spacious kitchen. It was modern and bright with windowpane doors on the cupboards and a view over the sink of what she imagined was Wendy’s summer garden. The base of the island was made of round stones interspersed with cupboards and a marble slab sat on top. Copper pots and stainless-steel appliances marked this as a professional’s dream kitchen while quirky touches like a cracked, antique bread bowl on a shelf and a cluttered breakfast nook told of the family that lived here. “It smells delicious in here.” The aroma of beef stew in the slow cooker competed with something yeasty. She waved Kristen to follow her around to the stairs that led up from the kitchen to a small landing. An angled shower stall had been shoe-horned behind a toilet and sink under a slanted ceiling, but it was surprisingly charming with a little frosted window, a couple of shelves, and wallpaper with ducks on it. “I imagine that would be handy.” Kristen bit back her smile, instantly suspecting by Wendy’s flustered glow that she might be carrying Sarah’s little brother or sister and wasn’t ready to reveal it yet. Kristen knew from her brother’s wife that couples often kept their special news under wraps for the first few months. She also remembered her sister-in-law being inexplicably distracted and occasionally overwhelmed throughout her pregnancy, but especially before she was showing. Wendy made a futile effort to straighten a card table where shopping bags were plopped next to fresh rolls of wrapping paper and colorful ribbons. “I’ve been meaning to start the wrapping.” Wendy blew out a breath that lifted the wisps of hair from her forehead. “I’m working on a cushion and matching curtains. It’s a long way from finished. This will be her closet.” Wendy opened a door into what would still be a spacious walk-in after shelves, drawers and bars were installed. Kristen took in the bed with the patchwork quilt and the desk in the corner, then nudged aside the gingham curtain to peer out at the cabins that were part of Mistletoe Chalet’s accommodation offerings. Each was under a thick layer of snow and had a puff of smoke coming from its chimney. “Oh, that’s exciting!” Wendy lit up with interest. Kristen fetched her luggage, then video-called her mother—and again had to talk her mother out of canceling her trip. “We won’t be out of pocket. You can come home like you planned,” her mother said. “The way your brother was when he found out they were expecting the first time?” her mother suggested dryly, making Kristen laugh. “That sounds fun.” A pang of disappointment struck at missing out, but also a twinge of relief. She ended her call, finished unpacking and came down to the kitchen in time to hear a huge clatter. She gave Wendy a bemused look. Wendy smiled and continued setting out wooden charcuterie platters on the island. “Ted just got back with the skiers. They’re putting away their equipment.” She pointed at the door she had shown Kristen earlier, the one that led to what Kristen realized must be a walk-out basement. “They must be hungry after skiing all day.” Kristen looked with alarm at the jars of olives and gherkins, the sleeves of crackers and blocks of cheese that still had to be sliced and cubed before it was arranged on the platters. She quickly washed her hands. “That must be hard to predict and cook for.” Kristen followed Wendy’s example and set a little ramekin of olives in the center of her board and built out from there. “They book ahead for the meals, but I cook a lot of stews and casseroles that I can stretch easily if I have to.” Wendy winked. Kristen had eaten a protein bar while she unpacked so her stomach wouldn’t be growling, but the aroma of bay leaves and allspice along with the freshly baked buns was homey and heavenly and made her hungry. “I’ve only ever skied at a regular ski hill with chairlifts. What’s it like to go up by snowcat?” Kristen asked, glancing up from scooping jam into a ramekin. “Especially if there are kids where?” Sarah asked, coming in with a fork that she dropped into the sink of soapy water. She fetched a clean one from the drawer. “Oh, I’d love that,” Sarah said with a bright smile. “What size are your shoes? You might be able to use my boots and skis,” Wendy offered. “That’s it for now. Thanks.” Instead of offering her hand for a high five, since she was still working with the food, Wendy offered an elbow. Sarah met it with her own elbow and disappeared to set the fork, then came back to the breakfast nook. She slid into the booth seat that wrapped the table and opened what looked like a school binder, picking up her pen with her other hand. “How do you have homework?” Wendy threw a puzzled glance at her. “And why aren’t you waiting until the day before school starts?” Kristen teased. “The way I did when I was your age?” She looked up from wrapping strips of prosciutto around cubes of cheese and skewering a grape on the way to pinning the dried ham in place with a bamboo shoot. “For Christmas?” Kristen guessed, forestalling the girl’s truly awful attempt to lie. “Yes,” Sarah said, voice tilting upward. She darted a worried glance at Wendy who was smirking at Kristen across the platters they were almost finished filling. Kristen bit her lip, thinking about the room that would be finished in the new year and what she suspected was Wendy’s bigger yet very tiny secret. “That’s one of my favorite parts of Christmas,” Kristen said. “I love keeping all the surprises under wraps. Not that I’ve had any really good secrets for years. I bought gifts for my niece and nephew, but she’s two and he’s only four months. It’ll be a few years before there will be a payoff for keeping secrets from them. Let me know if you want some help with whatever you’re planning,” she offered to Sarah. “Really?” Sarah brightened and sat up straighter. “Ha. Right!” Sarah nodded and her mouth tilted into a conspirator’s smile. Did you know that Wedding at Mistletoe Chalet and many titles are available digitally from Tule's own bookstore? Check it out!